Considering we're getting up to ten inches of snow today in Kansas City, I felt like writing about The Snowfield. But surprisngly, it comes from Singapore--not exactly a place known for its wintry weather. 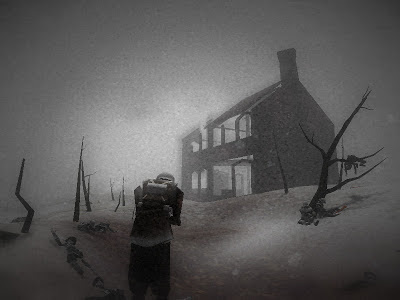 The Snowfield was developed by the Singapore-MIT GAMBIT Game Lab. GAMBIT was a collaboration focused on encouraging young game designers in Singapore to explore the medium. Their 2011 work is a war game, but not quite a wargame. In The Snowfield, you play as a World War I soldier walking around a battlefield in the aftermath of the battle. Considering the industry's fixation with wargames, this post-war image is a great commentary on the aftermath we don't get to see in other games. No shooting people, no action. Just suffering bodies in the cold.